Got the suit in time for Halloween. Wore it on campus and alI got were compliments on how accurate it was. I ordered the new Navy with Rust stripes and I fell in love with it the second I opened the package. Fits like a dream and my only fear is that Iâ€™ll wear it too much. 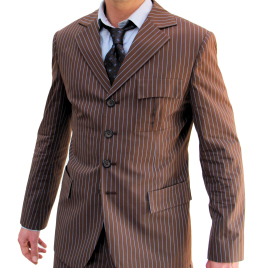 Anyone who wants to own an accurate Tenth Doctor Suit, this is it! !